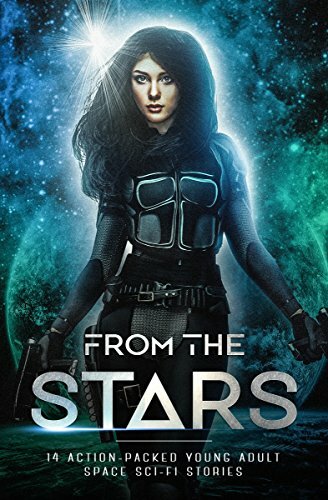 From the Stars was a limited anthology filled with 14 YA, space-themed short stories from a collection of talented authors. Unfortunately this book is no longer available. However, if you'd like a free copy of Elle's contribution BETWEEN THE EARTH AND THE STARS, click the link below. Arylia is an unwelcome alien seeking refuge on Earth; will her inexplicable friendship with Kyson, a law-abiding soldier, doom the planet? Sasha lives off the treasure she salvages in abandoned ships on the edge of the skolar system: until the day she recovers a lost popstar from 200 years ago. One rickety ship. Hundreds of refugees fleeing Earth. Millions of light years to an unknown planet. One chance for a new home. Anne has a strange feeling the mysterious lights in the sky have something to do with the number six she keeps seeing everywhere. When Evie meets an unlikely ally on her off-ship excursion, they must race against time before an impending war destroys their new planet. When her father is sent on his most dangerous expedition yet, Cortelia doesn't stop to think and sneaks along for the ride, never imagining a deadly alien agenda. Len is the sole survivor on an irradiated vessel deep in space, but is he really alone? Surviving the culling was only the beginning. Can they reclaim earth, or will the invaders destroy them? A snarky black-market trader who hasn't had a date in way too long, a broke-down, junkyard intergalactic ship with an attitude, and a beautiful alien to fall in love with. What could go wrong? Probably everything. Vega Volante, planetborn, planetstrong…and totally screwed.Vega must use her unique planetborn skills to confront an alien force that not only threatens her squad but could bring disaster to the entire Axis. Forced to marry her brother’s killer. Buried alive in an underground tomb. Celeste, sacrifices all for her terrible vengeance. The ever inquisitive Eos suspects the military is hiding something from the settlers on Sutorax, but she never imagines a deadly alien agenda. Arylia is an unwelcome alien seeking refuge on Earth; will her inexplicable friendship with Kyson, a law-abiding soldier, doom the planet? A race of body snatchers is deporting people to Mars, but Matt's fight to escape uncovers a disturbing truth about Earth and the Red Planet. Imprisoned. Enslaved. Seven girls dig for the source of life in a fight for freedom from powerful invaders.